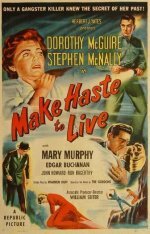 Dorothy McGuire fans need no persuading to watch this splendidly titled melodrama, in which McGuire is confronted by a neurotic criminal husband (a glowering Stephen McNally) who's come back to seek vengeance. In truth, though, this is a very average programme filler, from that period in McGuire's career when she was past her 1940s peak and before she superbly re-invented her screen image as an older, wiser woman in such hits as Three Coins in the Fountain, Old Yeller and A Summer Place. Director William A Seiter tries hard, but he's hamstrung by a tight budget and a short shooting schedule, both of which show.